Thank you for taking the time to read this blog. I pray that the stories inside will serve as an encouragement to your spirit and you will be reminded of the goodness of our Lord. "35Jesus went through all the towns and villages, teaching in their synagogues, proclaiming the good news of the kingdom and healing every disease and sickness. 36When he saw the crowds, he had compassion on them, because they were harassed and helpless, like sheep without a shepherd. 37Then he said to his disciples, “The harvest is plentiful but the workers are few. 38Ask the Lord of the harvest, therefore, to send out workers into his harvest field.”"
This rise of incoming students, hungry for the word of God and Christian community just affirms these words of Jesus. The harvest is plentiful, but the workers are few. Ask the Lord of the harvest, therefore, to send out workers into his harvest field"
Will you join me in praying for students to rise up and take ownership of the great commission by sharing what knowledge of Jesus they have with their friends and peers? Already I am having conversations with the students in our ministry who may not hold the title of "leader" but who as a result of the Lord's prompting have recently have been willing to rise up, take ownership, and be counted among the number of people who have said "Send me" to God. And as a result the Lord is sending our more and more workers into His harvest field at UTA. Please pray for these students who are leading one on one bible studies for the first time. Many of whom are timid and unconfident in their own ability. But how many of the heroes of our faith were initially confident and bold in the mission that God had given them? That is until the Lord promised them that He would be with them! Pray that the Lord not only equips these students out of his power, but also comforts these students by reminding them of His presence with them as they share His word with others. Carla made the decision just this last week to be baptized, proclaiming Jesus as the Lord of her life! Carla is just one of the many students who had been reached out to, invested in, and discipled over the last year and a half of her college career and as a result last week she chose to give her life to Jesus fully and completely! I'm so grateful to God for his working in her heart to draw her closer to Him. And I'm also so grateful to God for you who made all of this possible. Without your generous support of college ministry we would not be able to be on this campus and reach the population of college students that we can currently because of your help. 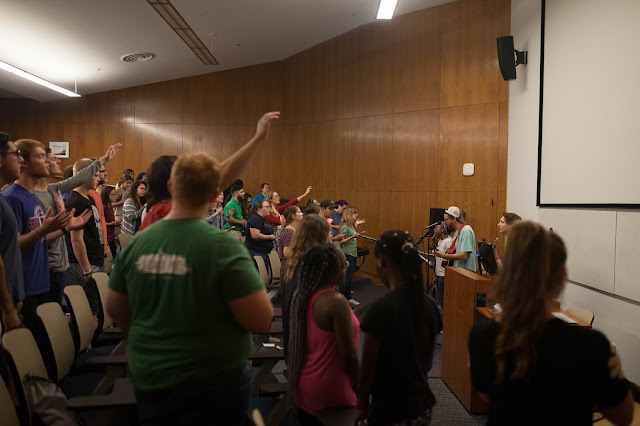 With over 40,000 students at UT Arlington there are still many more students in need of the good news of Jesus. Would you please join me in praying that we might be able to reach as many of those students as is possible? May it all be for the glory of God! Once again, thank you for everything! I pray that this letter finds you well. Don't forget to read the student testimony below!